Matthew Gaston’s Newly Released “Autopsy of A Deceased Minister” Is a Gripping Work That Shows the Grief a Deceased Minister’s Family Has Gone Through. “Autopsy of A Deceased Minister” from Christian Faith Publishing author Matthew Gaston is a moving work about Pastor Abbot’s death that has caused his family grief and the eye-opening discoveries that the family members find out after the autopsy is performed by the local county coroner. 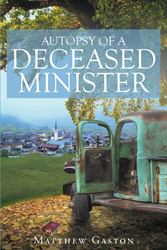 “Autopsy of A Deceased Minister”: a must-read book about the truths regarding Pastor Abbot that get revealed to his grieving wife and children after his horrible death. “Autopsy of A Deceased Minister” is the creation of published author, Matthew Gaston, a pastor and a facilitator for leader care in Arizona Baptist Children Services who has been around the globe together with his wife to share the Gospel to others. Published by Christian Faith Publishing, Matthew Gaston’s new book is a contemplative work about a pastor who is found dead behind the wheel of his truck under a clump of trees on the outskirts of town, leaving a family heartbroken with more questions that needs answers, especially after receiving the autopsy findings from the county coroner. Gaston’s short story is partly fictional—some parts are inspired by his own experiences and the stories of others. He hopes that his work will touch readers’ hearts and cause healing. View a synopsis of “Autopsy of A Deceased Minister” on YouTube. Consumers can purchase“Autopsy of A Deceased Minister” at traditional brick & mortar bookstores, or online at Amazon.com, Apple iTunes store, or Barnes and Noble. For additional information or inquiries about “Autopsy of A Deceased Minister”, contact the Christian Faith Publishing media department at 866-554-0919.